The violence at the heart of the book is mentioned briefly in Spanish accounts, but it is remembered more richly in Hopi oral stories handed down from generation to generation. Brooks’ challenge in Mesa of Sorrows is to integrate an unwritten history within a discipline that has traditionally privileged written records. Brooks opens with a lyrical account, à la Western outdoor writer Craig Childs, of a personal journey he made to the ruins of Awat’ovi in northeast Arizona, a settlement first visited by Coronado’s soldiers in 1540. Once an important Hopi village, Awat’ovi was suddenly depopulated in the fall of 1700. After the opening travelogue, Brooks tells us what happened to it. Awat’ovi had been more receptive to Roman Catholicism than its neighbors (as evidenced by its Navajo name, Tallahogan, or “singing house”). 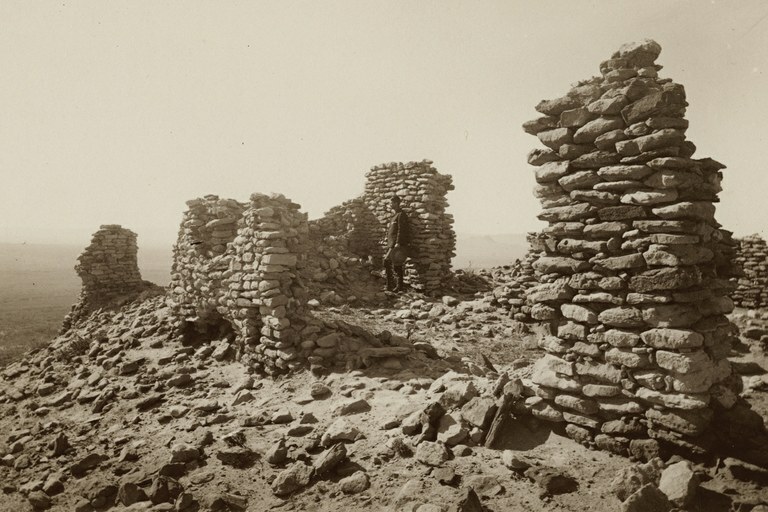 The Awat’ovi ruins in Arizona, circa 1915. The Hopi town was completely destroyed in 1700 by neighboring Hopi. When the village appeared on the brink of becoming a toehold for Franciscan missionaries and the Spanish colonizers who would follow in their wake, a coalition of other villages attacked. Warriors trapped the men of Awat’ovi in their underground kivas and set the chambers ablaze with torches, tossing in ristras of chile peppers — a hallmark of the Spanish influence in Awat’ovi. Some survivors were tortured and killed, and the rest were scattered among other Hopi villages. The attack was horrific, but it succeeded in minimizing the Spanish presence in Hopi for generations. The site of Awat’ovi attracted wide attention in the 1930s and ’40s, when excavations by Harvard’s Peabody Expedition uncovered dazzling murals painted on subterranean kiva walls. But the Harvard dig also found evidence of the village’s tragic end. Unburied bodies and kivas filled with charred wood seemed to confirm the grim oral stories that the Hopis told about Awat’ovi. 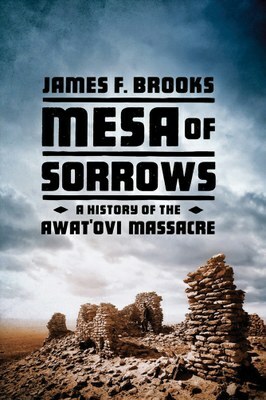 If Brooks had been an Anglo historian from an earlier generation, Mesa of Sorrows would likely have focused on archaeological findings and Spanish documents to reconstruct the demise of Awat’ovi. But Brooks attempts a more progressive approach by grounding his work in Hopi cultural memory. For example, in a chapter about the migration of Rio Grande Pueblo groups to Hopi, the author seamlessly blends information from Spanish documents and modern scholarship with accounts from Hopi storytellers and traditional clan histories. Brooks’ melding of Native American sources with conventional written history feels natural, and his treatment of Native cultural memory brings it closer to where it belongs — on a more equal footing with the written past. While the author’s use of Hopi stories is a step in the right direction, in other ways Mesa of Sorrows hews to an earlier tradition of historical writing. Brooks, for example, relies exclusively on previously published Hopi stories, which contributes to a sense that the Native tradition has been picked apart and reassembled to suit the author’s interpretation. He also chose not to collaborate with the Hopi Cultural Preservation Office while preparing the book. He writes at the beginning that Mesa of Sorrows will be “one author’s journey into a distant time and enigmatic event.” But that’s just the problem: The book threatens to become the story of the writer’s personal journey rather than that of the culture he seeks to understand. Mesa of Sorrows might be at its best when illuminating life in the Pueblo world during the first two centuries of European contact. Brooks successfully conveys a sense of the disruption created by the introduction of European technologies, crops and livestock. For example, the horse transformed warfare in the Southwest around the time of Awat’ovi’s destruction. The Hopis, farmers who generally avoided war, faced increasing threats from Spanish soldiers and newly horsed tribes like the Utes, Navajos and Apaches. Mesa vividly portrays a chaotic time when relationships in the Hopi world were being strained by the rapidly changing conditions. Brooks’ greatest success lies in the way he weaves the rich oral and written history into a single cohesive narrative. The book is an argument for authors of Western history to take Native cultural memory seriously. But in Mesa of Sorrows, there is still an unresolved conflict between the author’s desire to write “one man’s journey” and explain Awat’ovi from the Hopi perspective. The tension here suggests that bringing together Native and European approaches to history is still not an easy task. W.W. Norton & Company, 2016.